Howdy! My name is Vanessa Alejandro and I am from Houston, Texas! I attend the University of Houston and just completed my freshman year. The Rocky Mountain Biological Laboratory is my first research experience and I must say that it’s an absolute pleasure to wake up in the beautiful mountains of Colorado and be able to embark in the wonderful adventures of marmoteering. I was lucky enough to be able to conduct an amazing project involving pups. Initially, I studied the personality trait of boldness in marmot pups. However, the project took a complete turn once the results were analyzed. Now, my project involves the development of boldness and aggression in marmots. I studied boldness through flight initiation tests, which basically means I walked towards the pups at a constant pace until the pup chose to flee. The closer I got to the pup the bolder the pup was and vice versa. Doing marmot research here at RMBL has been an amazing experience and thankfully is not over yet! I have seen more animals here than I have my entire life. I have seen three foxes, two weasels, a vole, several mice, a coyote, several fawns, several deers, and numerous birds! Hopefully, I will be able to see either a bear or mountain lion before I leave! Just the other day, I was slowly but surely making my way up the steep slope of a marmot colony named Picnic when I heard a bizarre sound. It sounded like combination of a whine but cry. The noise stopped and I continued on my trek when I heard it again! I quickly scanned the surrounding area looking for some sign of life. Then I saw a cute fawn running up the slope as a coyote chased it. Marmoteering has not been the only source of my adventures. During my time off I have explored the mountains around Gothic. A few weeks ago Cody (fellow marmoteer and amazing friend) hiked up to the peak of Gothic. We started out at hiking in beautiful weather. The sun shined its warmth upon us and the wind provided a wonderful cool breeze, creating a perfect balance of cool and hot. We reached what seemed to be the peak but encountered a false summit. Unfortunately, this occurred another two times. Finally, on the third false summit we could see the actual peak of Gothic Mtn, but in order to reach this summit we had to walk across a thin ridge line. Before you knew it, we were walking across that ridge without a trace of fear on our faces and a knot in our stomachs. We reached the edge of the peak and climbed it quickly. We felt a moment of triumph as we stood on one of the highest peaks in the valley. Just as our hearts swelled with victory and awe we were attacked by hundreds of flies. As we climbed down the mountain, a storm cut across the sky and sent hail down our way. The hail quickly went from pin sized to marble sized and sent us running to the trees. Unfortunately, in our rush to safety we lost the trail and spent four hours trying to find a passable route to the road. It was definitely a great adventure. This experience has allowed to do absolutely amazing things, like sleep under the stars, summit mountains, camp alongside lakes, mountain bike, trap cute marmot pups, and make great friends like Cody, Matt, Ellen, Alex, and many others. I am so glad I have two more weeks left of some of the most amazing times of my life. Well we now think we might have a second mt. lion around here...or at least one that gets around. Last Friday, Cody saw what she thought was a mt. lion in the RMBL research meadow. About 2 hours later, and 2 miles up valley, and on the other side of the road, Adriana and Jorge were trapping our Cliff colony and while there, heard a marmot alarm calling, saw a deer running (which they thought was strange) and then saw the mt. lion 50 m from them. Then on Monday, my neighbor, Ward Watt, was walking down to RMBL through the research meadow (where Cody thought she saw one on Friday) and FLUSHED a mt. lion...he was closer than 50 m to it! What's disconcerting is that we're seeing this lion or lions during the day. They might be crossing roads in broad daylight. There have been some dead deer (and deer parts) seen around. Most years we never even see a lion kill and most years we never see a lion track. But this year is special! Are they hunting marmots? Don't know. But something we've always listed as a possible hunter is certainly around this year and could be eating them. My name is Ellen Bledsoe. I was born in Berkeley, CA, but my family now lives in Augusta, GA (talk about a big change!). This year I’ll be a senior at Mount Holyoke College, a small all-women’s college in South Hadley, MA. I’m a Biology major and an English minor. I’ll tell you a little bit more about myself later, but first let’s get to the research! Surprised? They definitely aren’t Dan’s usual study subjects. 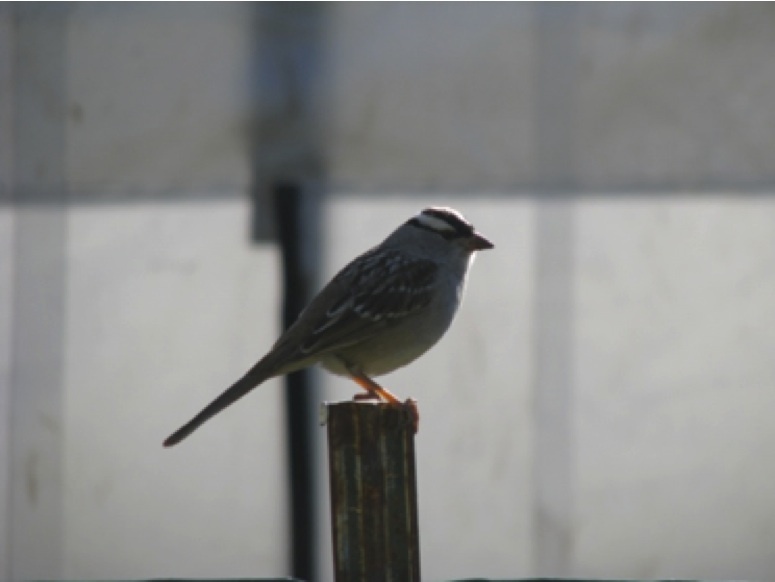 I’m doing a behavioral study that focuses on the response behavior of White Crowned Sparrows (Zonotrichia leucophrys , on left) and American Robins (Turdus migratorius, on right). As it turns out, Dan has another project going on aside from his marmots. He is fond of claiming that I am studying “the sound of fear.” What we are considering to be “the sound of fear” are sounds that are nonlinear. Examples of nonlinear sounds include white noise, abrupt frequency shifts and subharmonics. There are complicated physics explanations for what nonlinear sounds are, which I can’t quite grasp, but the general idea is that they are sounds with a form of distortion and are therefore unpredictable. They are often found in mammalian alarm calls (such as in marmots!) and can be produced when too much air is pushed through a vocal system, such as when an animal is in extreme stress. The idea behind the study is that due to the unpredictable nature of nonlinear sounds, these sounds will be more challenging to habituate to and may offer a more honest signal to conspecifics about nearby danger. Without going into too much gritty detail, I’m using five different stimuli: two “linear” controls and three nonlinear experimental sounds. Once I find a bird and am within 10-15 meters of it, I dictate behavior into a recorder for 30 seconds, play a stimulus, and record behavior for another 60 seconds. 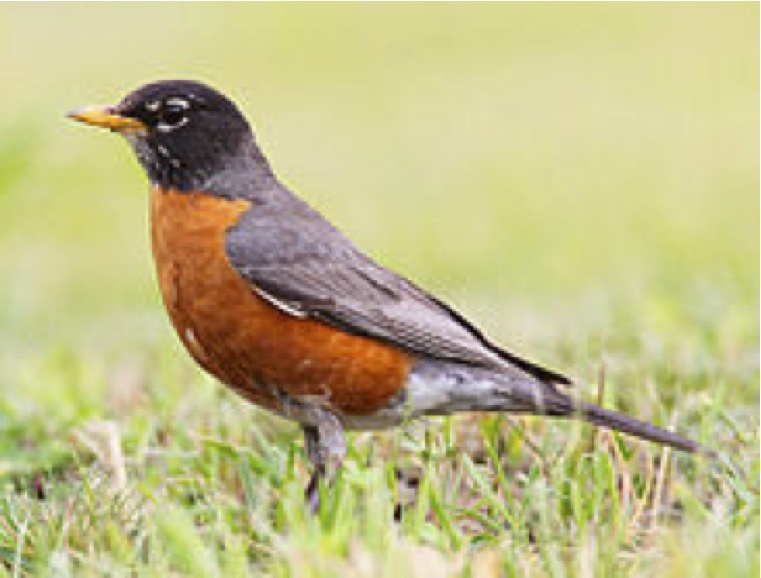 I then can compare the baseline behavior of the bird to its response to the stimulus. We expect that the nonlinear sounds with result in more evocative behavior, such as looking or flying. After a preliminary look at the data, we aren’t seeing as strong of results as we expected, but I’m still in the process of collecting data. I’ll be sure to keep you updated! So that is the general idea of the research I’m conducting this summer. It means a lot of early mornings and a lot of bike riding. But I’m looking forward to the results! 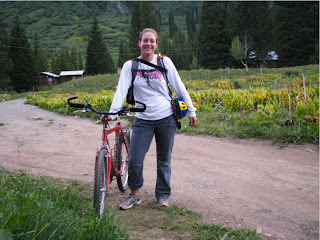 Now, for a little bit more about me outside of being an ecology and biology nerd! I love reading, especially books by Margaret Atwood and William Faulkner. Throughout high school and for my first year of college, I rowed, but due to injuries had to stop. I definitely miss being out on the water and watching the sun rise, though. I also really love music! I was in show choir in high school and, once I went off to college, joined the local Sweet Adelines International chapter, which is an international women’s barbershop organization. I’m by far the youngest in the chorus (by at least 30 years!). I also am in a West African drumming ensemble at school, where I drum, dance and sing. As for academic interests, I’ve always been had a passion for Africa—its people, its animals, its ecosystems—as well as the interface between animal behavior and its application to conservation biology. I’ve had the opportunity to study abroad in both Tanzania and South Africa and can’t wait to go back. Currently, my future plans include grad school in the next few years for a PhD in ecology and then perhaps academia. But who knows what the future holds! I just posted a blog entry about marmots and climate change and extreme weather events on the Huffington Post. My name is Alex Hettena. I recently graduated from Vanderbilt University with a degree in Ecology, Evolution and Organismal Biology. This is my first summer doing research with RMBL. 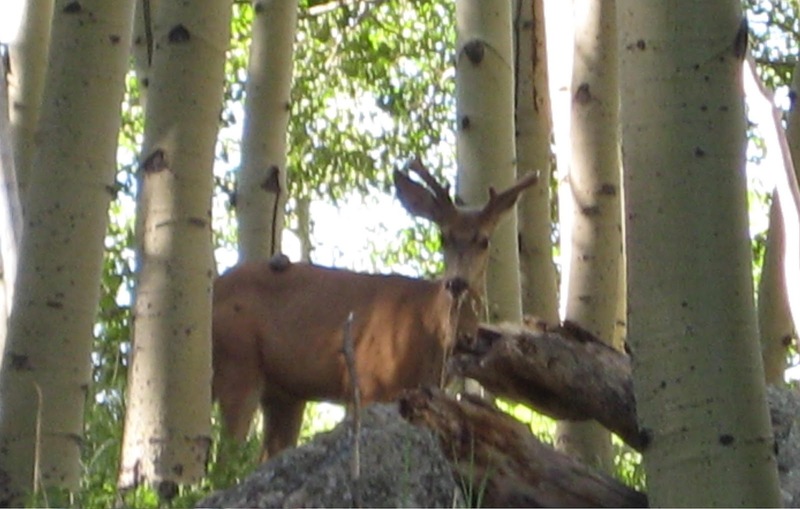 For my project, I am looking to see if mule deer can discriminate between predator vocalizations. This entails leaving my cabin while it’s still dark and trying to sneak up on an unsuspecting deer to play a call of a wolf, coyote, mountain lion, or pied butcherbird. If I’m lucky enough to actually keep the deer within a close range long enough to play the call, I sometimes observe the infamous escape gait known as stotting, common to pronghorns and other ungulates. I have come across a number of groups of deer repeatedly and inspired by the marmoteers identifying and naming their rodents of unusual size, I have named some of my subjects with unique attributes. Before I knew what a botfly bubble looked like, I named one otherwise handsome buck “Bubbles, the botfly-infested buck”. I later learned that the globular mass on his hip is a tumor. Poor Bubbles. Chamudi (Hebrew for cutie) is another slightly tattered yearling doe. Others include Teardrop, Goofy and Pluto (a pair of does), and Sty (a friend of Bubbles). The project has been an adventure traveling the 401 bike trail (for experienced bikers only, doesn’t include me), the 403 trail, Deer Creek trail, Snodgrass mountain; unexpectedly trudging through almost knee-deep mud; traversing Aspen groves; and sliding down the rain-drenched side of Picnic, one of the marmot sites. All of this has been challenging but completely worthwhile because I have seen much of the other wildlife that is active at the same hours. I’ve come across two black bears, been startled by multiple grouses, been road-blocked by a beaver and his branch, and seen spectacular sunrises and sunsets. The most worthwhile part though is the progress of my project. Earlier this week, Dan and I analyzed the data and found that what we have produces interesting results. The next challenge for me is writing up the final paper. I look forward to completing my project in due time. In the mean time, I really hope I finally get to see one of the fawns that hangs out in the town of Gothic. My name is Jorge Lopez. I am in the biology faculty at Santa Ana College in California. I am also a long time marmoteer. I worked with Dan Blumstein on his golden marmot research 20 years ago. In the intervening years, I took a detour to study parasite ecology and evolution. 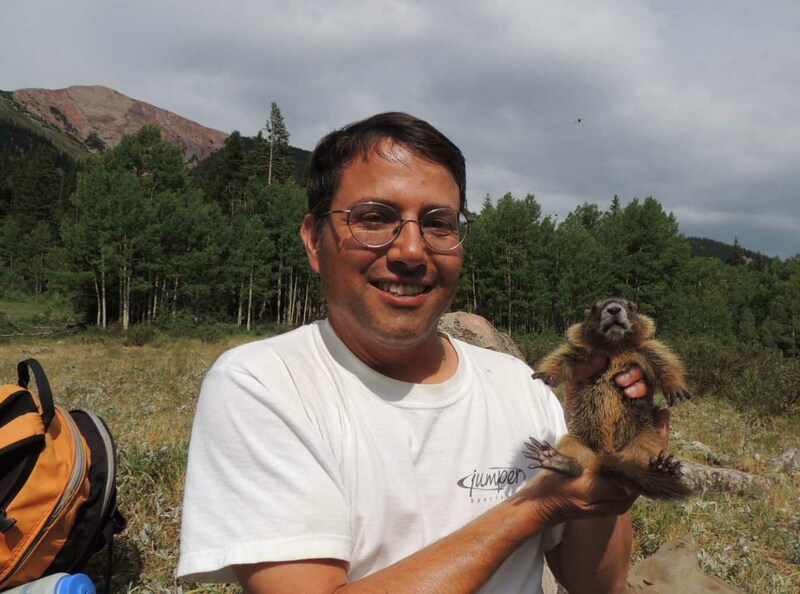 Dan has been collecting data on the parasites of the marmot population at RMBL for nearly a decade. I am exploring these data looking at relationships between parasite prevalence and colony size. It seems that living in a large colony may have a downside, at least with respect to one of the parasites that infects yellow bellied marmots. I am also helping with the day-to-day marmot observations and trapping. Especially now that the pups have emerged, it is fun to watch them playing and exploring their world. 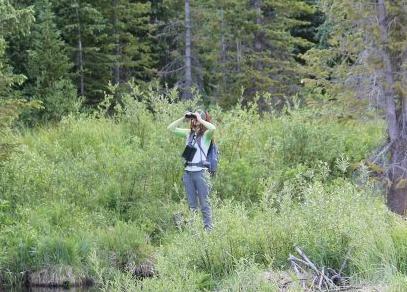 It takes a bit of concentration to keep eyes on the marmots though; the surrounding scenery can be distracting. I can’t help but compare our current marmot work with the work Dan and I did with the golden marmots. The marmots are a bit different, of course, but the biggest different is the location. 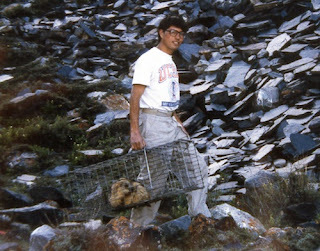 RMBL is deep in the Rocky Mountains, but it’s not nearly as remote and isolated as the golden marmot study site in the mountains of northern Pakistan. I’m glad I don’t have to rely on shepherds to deliver mail at unpredictable intervals, listen to the news on a short-wave receiver, or wake up to 0F temperatures at 5 in the morning.